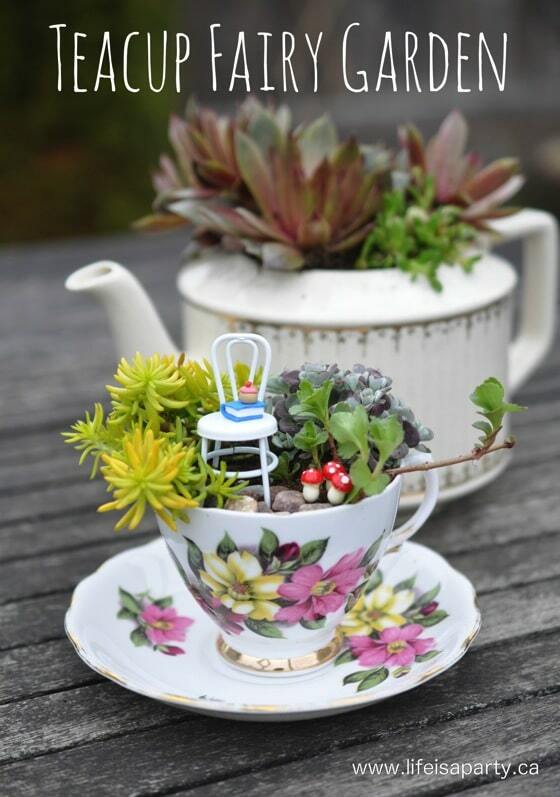 I love making fairy gardens, but this one in a teacup might be the sweetest ever. I wanted to make my mom a sweet little gift for Mother’s Day this weekend, and my mom loves to garden. She loves gardening so much that she has just about every plant at the garden centre, so giving her a gardening gift requires a little bit of creativity. 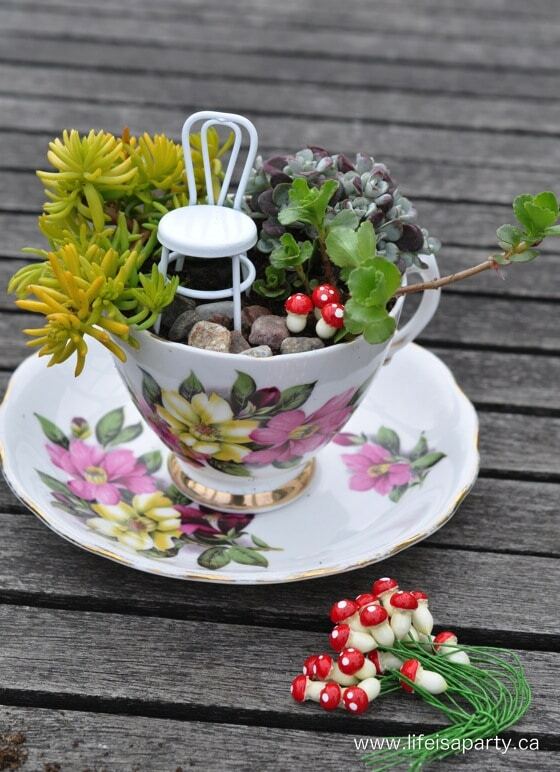 After our recent tea party, we had quite a few pretty vintage teacups around, and I thought it might be fun to turn one into a fairy garden. The problem with planting plants into tiny containers is that they dry out too much and die. The solution is drought tolerant plants -enter succulents. I’ve been loving succulents for the last couple years, but hadn’t really considered them for a fairy garden before. 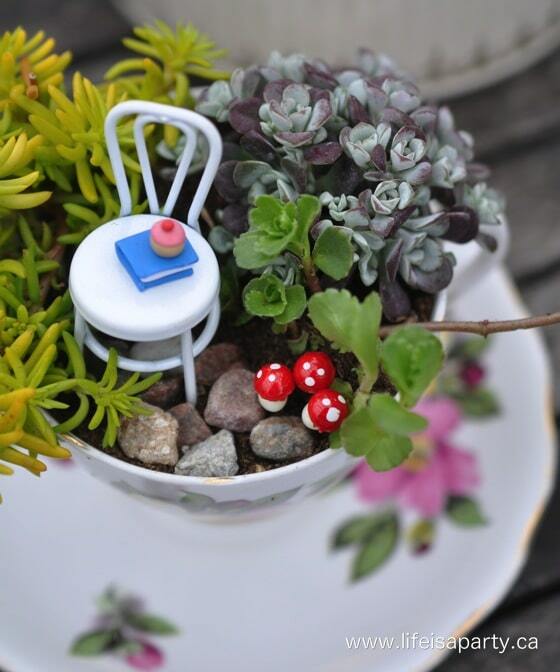 What works great here, is that they are really small varieties, and so there’s room even in a teacup for a few different kinds and a few little fairy accessories, like a place to sit for a rest, a book to read, and a cupcake to snack on -and really what more in life do you need? 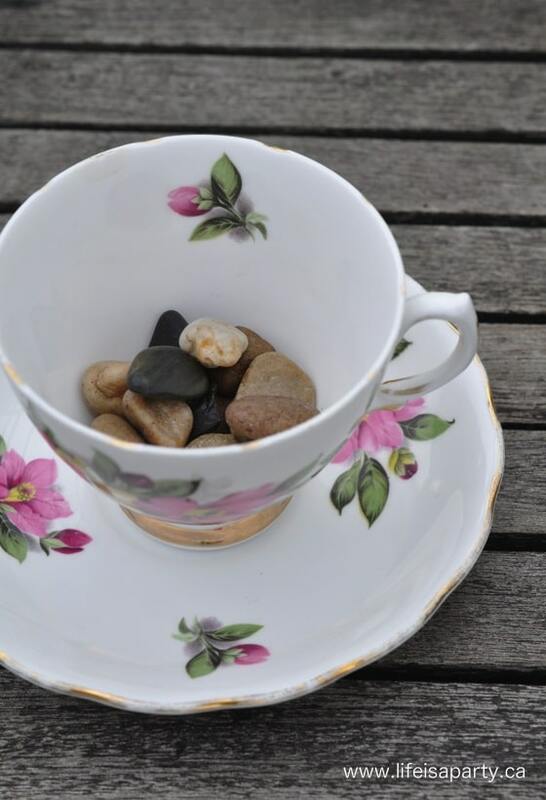 I started out with adding some rocks to the bottom of the teacup. 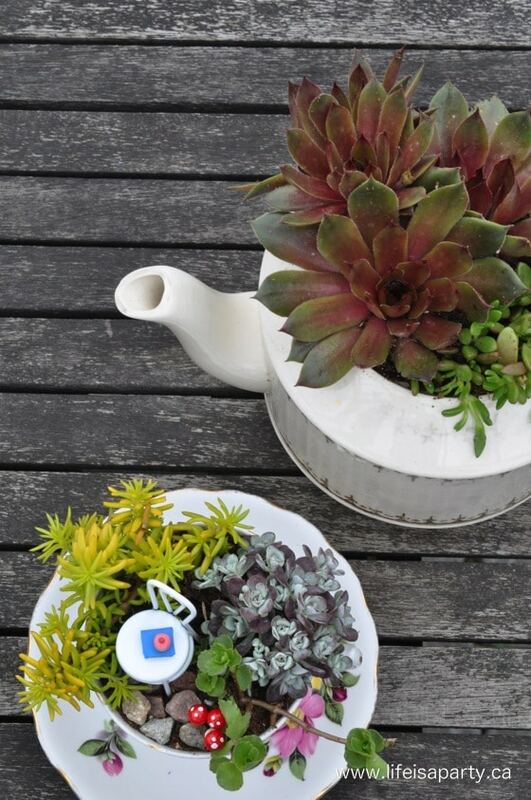 Succulents don’t like to be wet, and there’s no drainage in a teacup, so rocks are important. Using cactus/succulent soil will help too. I picked up a few really sweet sedum plants at the garden centre, and used one I already had. In case you’re wondering the bright green/yellow one on the left is Stone Orpine “Angelina” and the greyish/purple one at the back on the right is Stonecrop “Cape Blanco”. I positioned them, leaving a little room for a rock path using pea gravel and a miniature chair from the craft store. I also added a few faux mushrooms. To really make it inviting for a fairy I wanted to make a few little fairy treats, and I made them out of polymer clay. To make the book, start with some white clay. Use a mini rolling pin to flatten it out, and then cut it with a straight edge. 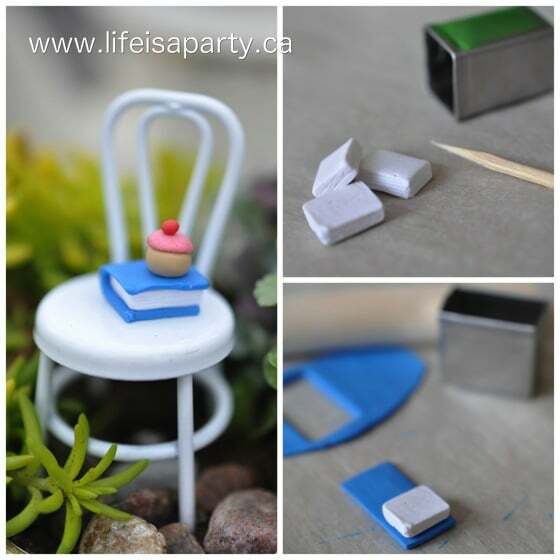 After it’s cut down to the right size, use a toothpick on the edge to add some grooves to look like book pages. Next, make the cover. Roll out another colour, I used blue, quite thin, and then cut it slightly larger than the book pages. Wrap it around the white, making sure there is no gap at the back between the pages and the cover. Bake in the oven according to the package directions, I baked mine at 250 degrees for 10 min. 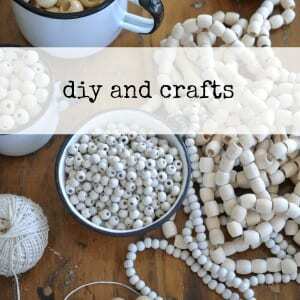 When you’re working with the polymer clay you could really create just about anything. Just remember to think about scale. I used the chair as my guide. Don’t be afraid to redo something if it seems a little off. Part of the beauty of this clay is that you can re-work if you’re not happy, up until you bake it. 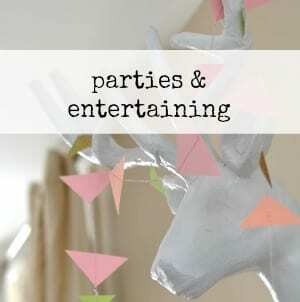 Think play dough, and have fun. To make the cupcake, I stared out with a tiny cylinder for the cake base. 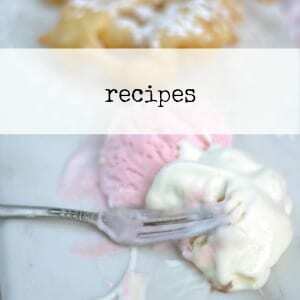 To make the icing, start with a tiny ball of pink, and then flatten it out, and add it to the top of the cylinder cake. 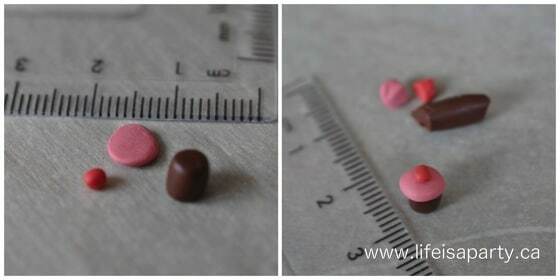 The cherry on top is a tiny ball of red clay. Put it all together and bake the same way you did for the book. I’m warning you, making fairy gardens is addictive, once you get started you start thinking of all kinds of little possibilities to add. Enjoy. 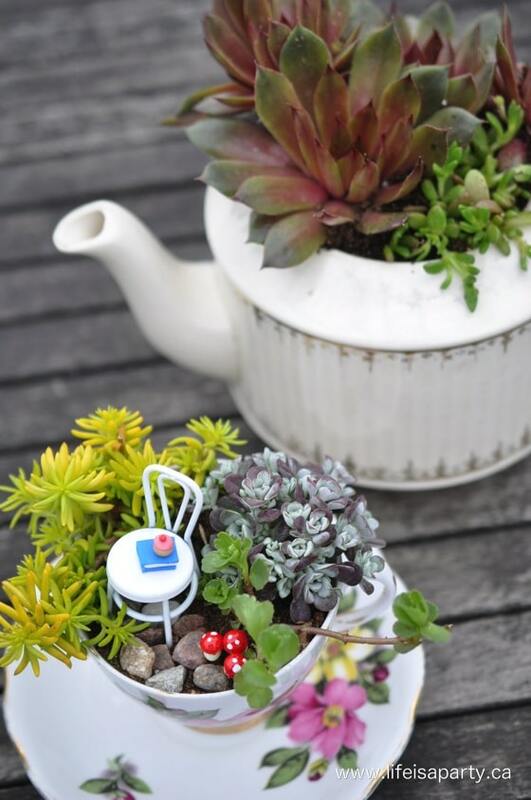 With a pretty teacup fairy garden for Mother’s Day, life really is a party! I LOVE this! 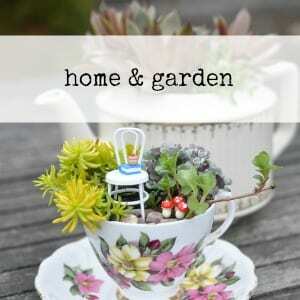 I am such a fan of fairy gardens and using a tea cup makes it super adorable. My kids have teacher appreciation gifts to make for tomorrow and I think this will be something their teacher will really enjoy. Thank you for the inspiration (and plant names). Lorena, Thanks so much for the comment, it so nice to hear from a reader when you use an idea. I hope the teachers love them. Happy fairy gardening! Such a great inspiration, I have never done that but I might try. Glad you like it Erin. 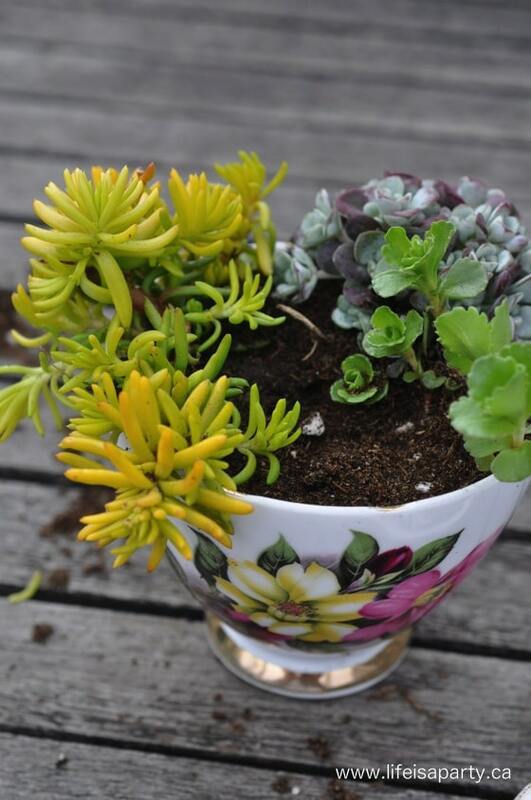 Give it a try, succulents are really easy to grow. This is completely adorable! I think I might have to attempt this with my daughter. She’d love to make one! This is the cutest little garden ever! 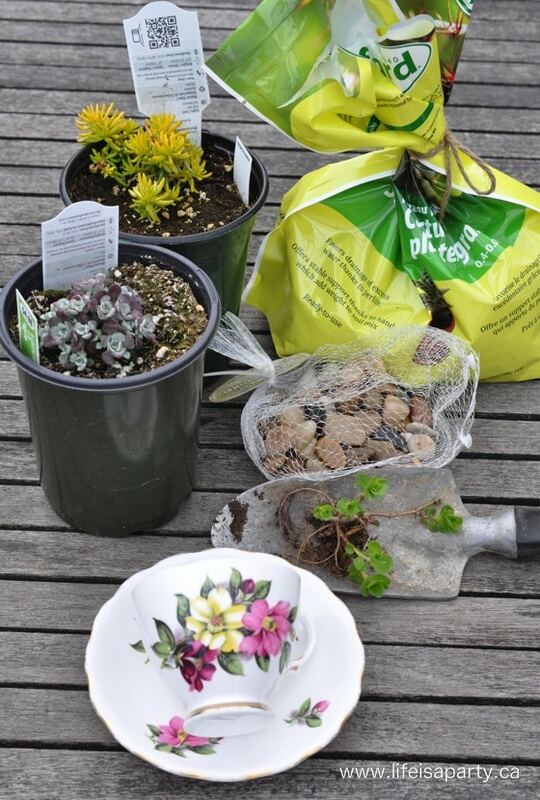 I have the perfect cups for this project…I see mini teacup gardens in my future! Love it! I’ve never made a fairy garden, but now I think I’m going to HAVE to do this, it is sooo cute! wow! these are just the most adorable little things! and such a pretty way to display a tea cup collection! Oh my goodness! SO sweet! What Mom wouldn’t totally love this?! oh my gosh, this is so adorable! I am so glad you showed how you placed rocks in the bottom for drainage!!! No one ever treats succulents right! They need dry soil with good drainage. Love these. I got some really cute teacups on clearance and thought about putting a plant in them. Instead I’m going to try your fairy garden idea. My husband drilled a hole in the cup so I’m hoping that will help with the drainage, but my concern is how much sunlight do these succulents need in the house? Your teacup is so cute and adorable. Thanks for any help. Hi Wendy, Sounds great! I’ve found that mine are fine with a sunny window. Hope this helps, best of luck. So darn cute ! I am forever buying fairies and this will be a perfect way to use them. 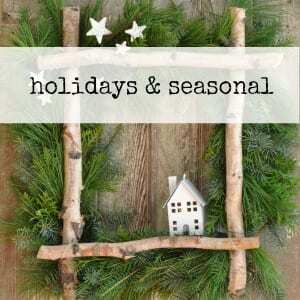 Will be sweet for Christmas gifts also ?? Wow this is so cute??? i really love collecting tea cups and pots?and i always thinking planting on a cup but i dont know how??? and this idea is really amazing!!! I love to make tea party!